Talbot Humane and Talbot Hospice are joining together to offer a Pet Loss Support Group for grieving pet owners. 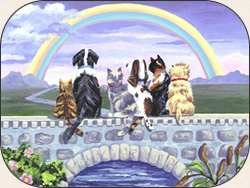 Our goal is to provide a safe environment to share your feelings and those cherished memories of your beloved pets. We hope to offer comfort as well as tools for healing through this difficult process for you, your pets and other family members. Meetings will be held the first Thursday of every month at Talbot Hospice House 586 Cynwood Dr, Easton, MD 21601, at 6PM. Doors will open at 5:30PM. We encourage attendees to RSVP by the Wednesday prior to the meeting to Linda Elzey at lwelzey@gmail.com or call Talbot Humane at (410)822-0107 but walk-ins are always welcome. Losing one’s beloved pet or companion animal can be an intensely emotional time. Please seek immediate help from a mental health professional, your family physician or local emergency room if you find yourself feeling helpless or hopeless to cope. Depression is a serious problem. Don’t overlook the signs and symptoms: uncontrolled crying, feelings of numbness or detachment, unable to complete your usual activities, overwhelming feelings of guilt or anger, decreased concentration or impaired short-term memory, social withdrawal, thoughts of suicide or wanting to die.